Nathan Fielder, host of Comedy Central's "Nathan for You" show, announced in February the show was behind the mysterious appearance of a "Dumb Starbucks" outlet in Los Feliz. The comic who came up with the fake-store concept will discuss its origins and aftermath on next week's episode of Comedy Central's "Nathan for You." 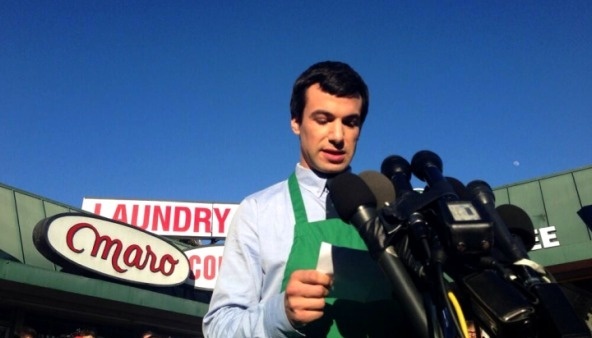 Star Nathan Fielder opened the Dumb Starbucks coffee shop in a Los Angeles strip mall in February. It quickly drew lines of curious residents, national media attention and legal scrutiny by the real Starbucks. The city's health department closed Dumb Starbucks after three days for not having the proper permits. So far, Fielder, Comedy Central and parent company Viacom Inc. have escaped legal action. But Dumb Starbucks is done. Fielder said the shop was a parody about the power of corporate branding that exceeded his expectations and ended up provoking discussion about how people consume art.